As I walked down the dock to see ALLEY G for the first time, it quickly struck me how beautiful the Selene 53 is. It is a “boaters-boat”, a “yachtsman-yacht” and the type of yacht that will turn heads on any water way and in any marina. From the Flag Blue hull and white superstructure to the reversed pilothouse windows, ALLEY G is truly stunning.The Selene 53 is one of the most successful yachts of the Selene Ocean Trawler line. It’s a displacement yacht meant for long-range cruising, big for her length and beamy. Her shape below the waterline and single engine is fuel efficient. The big slow-turning prop responds instantly to increases in throttle. Soft chines forward sharpen to hard chines near amidships, and from there to the transom, the run stays flat, much like that of a ship. It sweeps up to let solid water flow to the prop and rudder. A keel of barely discernible drag becoming deeper aft than forward provides directional stability, helps damp roll and protects the prop and rudder during grounding. The Selene 53 has its master stateroom amidships, the area of least pitching, a general design principle for a cruising yacht. As Bill Parlatore of the prestigious American magazine Passagemaker writes, “Gunkholing Alaska or cruising the Caribbean, the Selene 53 does it with ease. And it has the long legs to cross oceans. “ALLEY G is seriously for sale. The seller completed the Northern Route of the Great Loop in the Summer of 2018 and is ready to spend more time ashore. The maintenance is up to date and the systems are entirely functional. 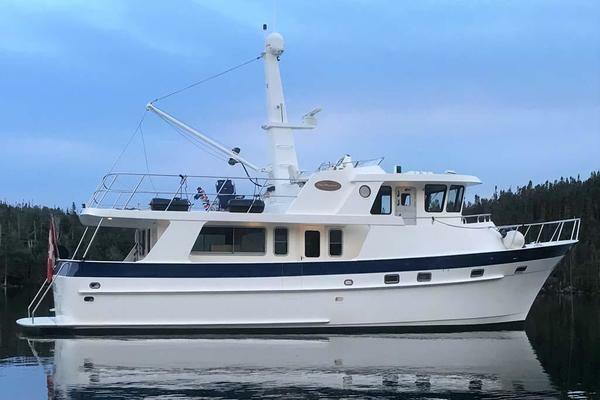 No disappointments in ALLEY G.
United Yacht Sales New Jersey would love to guide you through a personal showing of this 53' Selene 53 Long Range Ocean Trawler 2006. This yacht for sale is located in New Bern, North Carolina and priced at $775,000. For a showing please contact us by filling out the form on this page and we will get back to you shortly! The interior is stunning with teak and cherry interior woodwork and joinery, light blue salon fabrics and light blue leather pilothouse fabrics, louvered doors, and teak and holly flooring.The overheads are beautiful and feature teak hand rails. The windows are large and bring in an abundance of natural light and ventilation.Enter the cockpit by way of the port, starboard or stern doors. The cockpit is large and has a settee aft with a table with a folding down leaf. The swim platform is aft and offers excellent safety to maneuver with added stainless-steel rails. Forward and to starboard is a cabinet that offers engine and bow thruster controls by opening the top and storage below. The sides are wide and offers ease of maneuverability and safety. There are two steps up to the pilothouse level leading to port and starboard pilothouse doors. The foredeck is protected with a Portuguese bridge with storage and a doorway that leads onto the bow. The bow offers safety with oversized stainless-steel stanchions and rails and access to the anchor windlass and bow pulpit.Back to the cockpit there is access into the stern lazarette. In the lazarette is the combination washer/dryer, plenty of storage and the Volvo auxiliary “Get Home” engine. Access into the engine room is through a water tight door.You enter the main salon through a Dutch door. The salon is large and has a L-Shaped settee to port with a high-low table that has two folding leaves. The settee will slide open to make a double berth. Under the settee is access to battery switches and storage. Along the starboard side is a straight settee with an aft built-in end table. The salon windows are covered with wood miniblinds and some open with screens. Forward and to port is the U-Shaped Galley. The galley is large and features large appliances and plenty of storage and food preparation spaces. Additional engine room access is gained through a hatch in the galley flooring. Across from the galley is a cabinet with additional storage and a stairway that leads to the master stateroom and water tight door into the engine room. Above the steps is a china storage cabinet. Up three steps from the galley area is the pilothouse. Just inboard of the steps are storage cabinets and a cabinet with the ice maker. The pilothouse offers excellent visibility. There is a centered helm with single helm chair. Aft of the helm is a L-Shaped seating area that is elevated to ensure the guests have an excellent view as well. Above the seating is a single watch berth. The helm area has excellent access to all ship’s systems and electronics. Aft and to starboard is the steps that lead to the flybridge. The flybridge is protected with a dark blue Sunbrella bimini. The helm is centered and has a helm and companion seat. Access to all electronics and controls are within easy reach. Aft of the helm seats is an L-Shaped settee for guests. The helm area is protected with stainless steel safety rails. Along the starboard side is a cabinet for storage and the center top opens to reveal the electric BBQ grill. The aft bridge deck has dingy storage chocks to starboard and the davit lift to port. There is storage for two kayaks or paddleboards. The radar arch can be folded down if needed for height restrictions.Back to the pilothouse and down the forward spiral steps is access to the staterooms. Immediately aft is the master cabin that also has access from the galley area. The master is large and comfortable. The queen berth is centered with port and starboard built-in night stands and storage. Along the port side is a large cabinet with storage drawers and the aft top opens for a vanity with mirrored top. There are hanging lockers and storage as well. To starboard is the master head with large vanity and separate shower stall. The head sole is granite and the shower has a removable teak grate. A privacy door aft opens to the aft companionway and the forward privacy door opens to access the other staterooms and steps to the pilothouse.In the forward companionway and to port is the guest cabin with high low bunks, ample storage and an office desk area, hanging locker and a privacy door. To starboard is the guest head with vanity, storage, separate shower stall, granite flooring and a teak grate in the shower. All the way forward is the VIP cabin with a centerline queen berth with port and starboard step up for ease of getting into bed. Along the port and starboard sides are storage and hanging lockers. Overhead is an opening hatch for added light and air. A privacy door leads to the cabin companionway.Back to the forward master companionway there is a water tight door that leads into the engine room. The engine room is large and offers complete access to the John Deere engine, generator and ship’s systems and controls. All pilothouse and flybridge electronics are within easy reach of the helm.Pilothouse:Moving up three steps from the main salon one enters the pilothouse, which is the epicenter of the Selene. The pilothouse features a large L-Shaped settee and teak table for the captain and crew. It is raised by about six inches to help improve outward visibility. Just aft of the settee is an off-watch pilot berth. The pilothouse features Diamond Sea Glaze Dutch doors on either side for access to the forward decks. A companionway leads up to the flybridge and a stairwell down to two staterooms. Flybridge:Up a few steps from the pilothouse is the flybridge. Large with excellent visibility and plenty of guest seating. Along the starboard side is a cabinet and electric BBQ grill. Overhead protected by a Sunbrella bimini and access to the RIB is aft. If your looking for a beautiful long-range pilothouse trawler you owe it to your self to visit ALLEY G. No disappointments on this one.No hurricane damage as the boat was brought to New Bern after the storms for me to sell.Easy access into New Bern (EWN) with jet service via CLT (American) or ATL (Delta).